The Aegean Sea gently laps the rocky shore a few feet from where we sit, its rhythm a soothing counterpoint to the searing heat of the midday sun. Along with a handful of other tourists, we’ve ducked under cover just in time. As anyone who’s been to southern Greece or the Levant knows, this is the time when the sun’s intensity bleaches all color from the strewn rocks and the hills beyond, and causes mere mortals to seek shade, a beer, and a simple table. It’s no wonder to us that most of the locals are napping. Crete had changed in the time we’d been away. The island that over thousands of years survived invasion by Mycenaeans and Romans and Turks was under siege by European tourists on package holidays. Ten years earlier, we’d poked through store-houses and royal bedrooms at Knossos and ogled paintings on the walls of the world’s first bathrooms; back then the palace was ours to roam. This time, the place was overrun by a thousand pushy Germans and Frenchman and red-faced lager louts, whose tour buses belched diesel fumes in the fresh parking lot nearby. When we weren’t jostling for a spot on the beach, or standing in line for a table at one of the local restaurants, we were accosted on the streets of Malia by thumping bass that spilled from the clubs, and by Australian girls who thrust coupons into our hands for free drinks. To escape the hordes, we fell into a routine of noshing afternoon tyropeta in the little garden oasis we called our own. 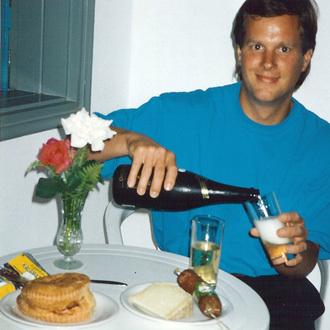 Over a glass of cheap Cretan champagne, we decided it was time to get away. We found the old Crete we remembered on the northern shore at Chania. There, the waiter by the pool had the grace to blush as he told us we could expect little nightlife. The next morning we headed west, out onto barren stretches where the road gave way to cart tracks and herds of goats blocked the way. 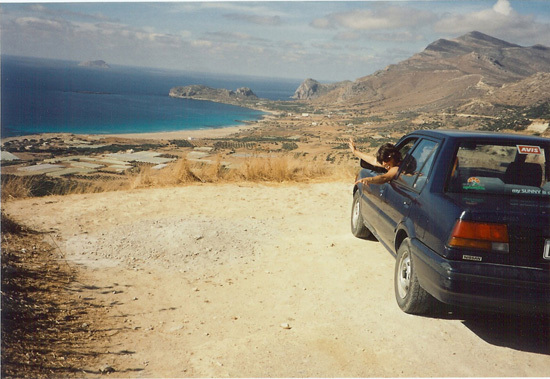 Near the northwestern edge, we sighed at the views across the sparkling Aegean, that stretched until forever. That afternoon we came across a small town tucked into the bay where the sound of Greek fishermen calling out their catch was the loudest thing around. The modern world was a million lightyears away. There, two brothers who knew no English brought us some of the tastiest fish we’d ever eaten. Nothing fancy, but perfectly fresh and grilled with thyme and olive oil and salt. When I make this fish at home, it takes me right back. To the sea, lapping at the rocks; to the rush of quiet stillness that assures me that the moment is enough. And in the chill of an overdue Seattle spring, I feel the warm Mediterranean sun kissing my shoulders. Over fish so fresh – so simply Greek – the stars realign. Prepare the fish: Choose the freshest fish you can find. A fillet from the center about 5”x 9” and 1¼” thick is just right. Cut the fish lengthwise into 4 pieces, sprinkle with the thyme and sea salt and drizzle with olive oil. Cover with plastic and let marinate while you get the coals ready. 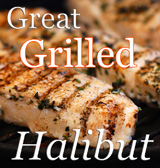 Heat the coals: This fish is best grilled over mature coals on a small charcoal grill. I use a Smokey Joe by Weber. 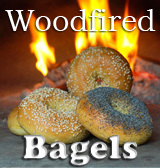 With the vents half open, light 25 briquettes and let them burn until glowing hot, about 30 minutes. Spread the coals out and add another 10 briquettes. Put the grill in place and heat it for 5 minutes before scraping it clean. Brush the grill lightly with olive oil. Grill the fish: Grill the fish for 4 minutes. Turn gently with large tongs, and grill for a further 5 minutes. In the last minute, sprinkle on any excess olive oil left in the marinating bowl. The fish will be done when it is white and flaky. Remove to a plate and serve immediately. Now imagine the green Aegean Sea beyond the table and the sun turning the hills brown in the distance. A few red potatoes? Some Greek wine? Oh, yeah. It’s all good here! Kali Orexi! I love how simple this recipe is yet the fish looks amazing! And what a beautiful photo of Crete. 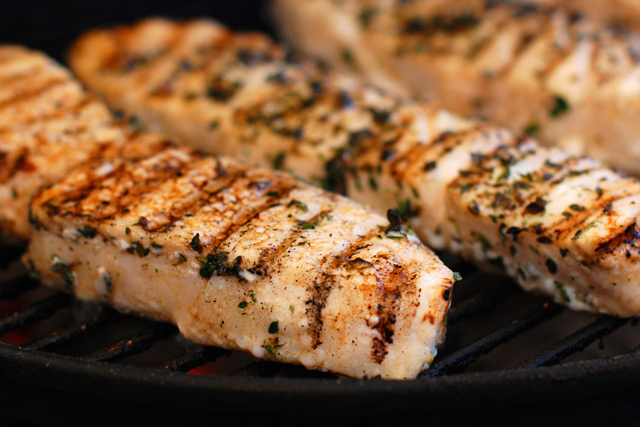 Your fish on the grill looks fantastic! Pacific halibut really has no equal for that rich taste. A fun, well-written travel tale. Great photo, as well. So far Greece has to be the best vacation I’;ve had so far. Your halibut can grace my table any day Don. I haven’t been to Greece in years but this post took me right back there! Especially the champagne! Halibut looks superb! I was told to lower my cholesterol asap! I could eat this EVERY DAY! Loving how great this fish looks right now! The fish is perfection! What a great photo of you! Talk about excellent timing, Don! I decided to have halibut for dinner tonight, but could not decide on the manner of cooking. Personally, I can get pretty tired of deep and pan-fried, so grilling sounds perfect. Thanks for this wonderful looking recipe, and the great story!